Jon Jones fights Ovince Saint Preux for the interim light heavyweight title in the main event of UFC 197, and Demetrious Johnson defends the flyweight title against Henry Cejudo! Coverage begins tonight at 6:30 PM ET, 7:30 PM CT. Follow me @PeachMachine on Twitter. Kevin Lee started our round 1 really strong but Efrain Escudero finished the round strong. 10-9 EE. Pretty even through two. Either guy could win this match by winning this round. Both guys looked gas with about 3 minutes to go. Josh Crouch is in EE's corner. He's really smart, but EE isn't doing what he told him. Both men have landed an even amount of strikes. Lee trains BJJ under Robert Drysdale, a BJJ legend. Too bad Lee clearly never trains BJJ because he should have been able to easily pass EE's guard. Lee beat up EE from top in half guard. Lee definitely won the third finishing strongly on top. We will see how the judges saw it. My score is 29-28 Lee. Kevin Lee wins by unanimous decision on three scores of 29-28. PeachMachine's Projection: Skip this boring match. Go pet your dog or child or something. *Goldberg plugged the Eddie Bravo invitational BJJ tournament which will air live on Fight Pass. That's pretty awesome. It's a 50,000 dollar winner take all BJJ tournament. Watch that instead of the first match here tonight. They just aired a sweet promo for Cejudo. The kid is a decorated wrestler for sure. Can he beat DJ? We will see. Hester was murdered. RDL landed a shot that dropped Hester. The rest of the round was RDL dropping bombs from short range which opened up the arm triangle. Marcos Rogerio De Lima wins by submission (arm triangle) at 4:35 of the VERY first round. It's the very first round. Not the negative one or zero round. PeachMachine's Projection: A one sided whipping. You've seen this before. Skip it. Keep petting your dog or child or lover. But not your cat. Cat's are sneaky jerks. Walt "Big Ticket" Harris has the best nickname I've heard of since my friend Mikey gave himself the nickname "Teamwork" because, I guess he loves teamwork, which is an awesome thing to love. My little brother game himself the nick name of "T-Boogie" because he thinks he's a good dancer. He is not. This one round fight was highlighted by big shots from both men and then Cody WHOMPED him in the wienie. That looked like it hurt. East is using the weird front "teep" kick effectively. DC is in on commentary. WHOA! East just threw a blur of punches! What an exchange. BUT WAIT Harris drilled him and is looking for the kill! East is in trouble, Harris landing bombs and gets the finish! BIG TICKET BAY BAY! He went right over to the cage and commented soemthing to Rogan and DC. Apparently he said to Rogan, "I've been waiting for a long time to talk to you." Harris showed great respect for Rogan and then cut an enthusiastic promo. Big Ticket earned some respect tonight. Walt Harris wins by TKO at 4:18 of round 1. PeachMachine's Projection: Yes, watch this! Two big guys swinging wildly, what's not to love? Carla Esparza wins by unanimous decision on three scores of 30-27. So they didn't give Lima the credit for her BJJ like I did in round one. Oh well. PeachMachine's Prognostication: You will watch this fight because it's actually an interesting ground battle. In an aside, I went to the movies last night and as we walked in with the tickets, the person I was with waved them casually at the 16 year old pimply faced teen as if to say, "These aren't the droids you're looking for..." A rather bold move from a non Jedi, I commented. *Thankfully, they recapped the Nascar results. I can't remember but if I had to guess, Jimmy-John Jimjohnson won. Ya. Danny Roberts wins by unanimous decision on scores three scores of 29-28. PeachMachine's Paranoia: WATCH THIS FIGHT OR I'LL POUR HOT COFFEE ON MY CROTCH! Round won was Pettis showing off his kicks. He landed but not much damage. 10-9 Pettis. Round two was more of a ground game as Kelades was on top for much as Pettis attempted to use his BJJ. Kelades mostly dominated with some inside grappling and knees. Pettis finally got clearance and started to strike but ran out of time. 10-9 Kelades. This is far more even than I anticipated. Kelades put so much pressure on Pettis that he just couldn't get going. Kelades was far more game than I remember. I think he won this round 10-9 and the fight 29-28. Sergio Pettis wins by unanimous decision on three scores of 30-27. Huh? PeachMachine's Probability: Well, I guess I have no clue what fight I was watching because I thought it was pretty clearly for Kelades, but he didn't even win a single round on ANY score card? Crazy. I should have used "paranoia" for this one. An exciting first round, but really even. I think Fili did more damage and was more active on the ground. He looked liked he was having fun. I scored it 10-9 Fili. A lot of wild kicks from Yair and spinning and BANG before I could finish that sentence, Rodriguez hits a jumping round house kick to the face and scores a phenomenal highlight real kick knock out. Yair Rodriguez wins by knock out at 2:15 of round 1. PeachMachine's Passive-Agressive Response: Should you watch this? Huh. Well, unless you're an idiot that doesn't like awesome kicks, YES! Not a lot happened until the last 30 seconds when Whitaker tagged him and uncorked a barrage of stingers and lit up Natal. 10-9 Whittaker. Whittaker is putting on a striking display and is doing well. He's hurting Natal with everything. Natal is taking a beating. 10-9 Whittaker. Natal needs a finish in my book. Whittaker is using that jab really effectively. I'm not sure if I'm crazy but I feel like Rogan thinks Natal is winning. I don't think there's any doubt that Whittaker won this round, especially in the last 10 seconds when Whittaker connected with a monsterous head kick. I gave him all three rounds and the fight 30-27. Robert Whittaker wins by unanimous decision on scores of 29-28, 30-27, and 30-27. Edson Barboza wins by unanimous decision on scores of 29-28, 29-28, and 30-27. PeachMachine's Premonition: A whole lot of strikin' going on... I enjoyed it. I give it a 6. Dang son, that didn't last long. Cejudo was successful early with the takedown but he never hurt the mouse in any way shape or form. Cejudo was outclassed and embarrassed and should take a long hard look in the mirror. No I'm kidding, he was beaten by the best. Mighty Mouse put it on Cejudo and got the finish in the first round after some hard knees and some ground and pound. Demetrious Johnson wins by TKO at 2:49 of round 1. PeachMachine's Paraphrase: Watch this one. DJ put on an MMA clinic then put on a plug clinic getting all his sponsors a mention. Another amazing performance by the best fighter in the world. OSP is using some unusual walk out music and is draped in a Haitian flag. That's no way to win over your hometown Knoxvillians. Jones is using the song "I'm coming home" by Skylar Grey. I'm sorry that information ever perforated my brain. He looks like he's about to throw a beatin' on OSP. They touch 'em up... He comes out on all fours. OSP looks very hesitant. This could end like Cejudo. Jones is opening up with some kicks. OSP doing nothing. Jones landed some solid body kicks and not much else. He scored a takedown at the end of the round. Jones for sure 10-9. Jones caught a kick and attempted the tree top single finish bout OSP survived. OSP chants from the crowd. That's fun! Just in time to Jones to dig some elbows into OSP's forehead. OSP tagged him with one good shot. Jones caught him with a side kick on the knee. OSP is slowing big time and it looks like it's a matter of time for OSP. OSP did land one solid spit take shot but that was it. Jones ended the round with a jumping spinning back kick that landed calf to brain. 10-9 Jones. OSP still hangin' tough midway through the third. Jones now starts to use those oblique kicks to the knee. Jones landed a solid jab. OSP just wading forward not setting up anything. OSP still frustrated and on the end of the Jones jab. 10-9 Jones. OSP survives into round 4. He may as well let it go becasue he's not winning a decision. 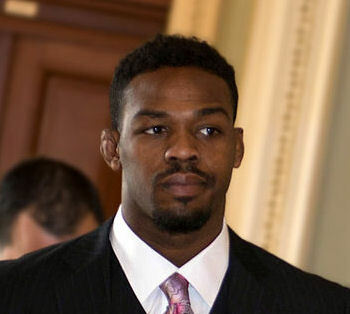 Jones puts him on the cage and Jones picks him up and dumps him. That's what all that dead lifting will get you son! But OSP got right up so it was for naught. Jones gets another takedown and pins him on the cage. Now it's time for some nasty ground and pound. OSP is now mounted. Oh hell son... OSP was saved by the bell literally as he looked up in terror right as Jones was about to land the final blow. 10-9 Jones and nearly death. Jones is playing it very conservatively here. He's not looking to finish, he's just stalking, content to let OSP swing and miss. Now he gets another big takedown but OSP gets back up! Jones has him pinned against the fence and starts landing elbows, but it's not enough to get the finish. Jones wins 50-45 in a less than impressive fashion. Jon Jones wins by unanimous decision on scores of 50-44, 50-45, and 50-45. PeachMachine's Professional Opinion: This was a fun card that had some fun fights, but not worth buying the replay. Jones cut a less than impressive promo as well. He made some boring excuse for having a mediocre fight. You gotta hand it to OSP. He hung in there, and as DC put it, OSP got the rub from Jones. He's legit, but Jones is legitness.